Many people look after their suits badly. This may seem obvious. After all men hang their suits on pegs, leave them on the floor after a day’s wear and occasionally bundle them into bags. For the most expensive piece of clothing a man owns, it is generally not treated well. But the biggest mistake he makes is dry cleaning his suits too often. The chemicals in the dry cleaning process damage natural fibres of wool or cotton, thinning and weakening them. Over time the material at stress points such as the crotch and elbows will wear down. Dry cleaning is still the most effective, indeed really the only effective way to get dirt out of these materials. But often the suits simply aren’t dirty. 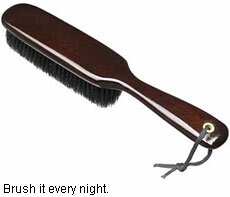 Any dirt that does accumulate during a day’s wear can easily be brushed off in the evening. Simply hang up your jacket and trousers and brush them a few times with a soft-bristled brush. This removes the specks of dirt before they can get ground into the material through wearing or pressing. Suits brushed this way after use should only need to be dry-cleaned twice a year. Some enthusiasts recommend only dry cleaning your suit before it is stored away for the season – so once a year – but this rather suggests that they own more suits than the average man, meaning few uses of the suit each week, and only wear a suit for six months of the year, again suggesting less use. Dry cleaning twice a year should be sufficient for a suit worn once or twice a week. If you wear a suit more often than that, its lifetime is going to be considerably shortened anyway. Hang your suit up every night and always leave it for a day before wearing again, to let it recover and drape out its wrinkles naturally. Heavier materials and linen should be left for at least two days. Many recommend steaming your suit in the morning to remove any last wrinkles. This is often impractical, but it is worth doing occasionally. Buy a portable steamer, or use the steam setting on your iron to puff steam into the material while it is hanging up (make sure it is on a low heat as well). You will sometimes see staff in shops doing this to suits on display, to make them appear crisp and fresh. If the crease on your trousers also softens over a few weeks, this can be steamed back in with an iron, but again make sure it is on a low heat. That’s pretty much all you need to do. Store the suits with plenty of space between them in a closet, preferably in cloth suit bags to keep moths away (the brushing out of dirt should also make the material less attractive to the little bleeders). And if you are the kind of man that stores seasonal suits away for six months, make sure they are clean and wrinkle-free before you do so. You can follow the discussion on How to look after your suits by entering your email address in the box below. You will then receive an email every time a new comment is added. These will also contain a link to a page where you can stop the alerts, and remove all of your related data from the site. As always, damn good advice Simon! I’ve gone a little nuts buying clothes brushes, and I am glad to read that my instincts on not dry cleaning too often are corroborated. It’s tough to find dry cleaners that really know how to clean and press your suits as well as the tailor who made them originally. I find that they tend to comeback flat and lifeless, even though I tell them always to be careful to maintain the roll of the lapel. That’s a very good point, and I’ve meaning to get one of those for a while. What make is yours and would you recommend it? Does it save space having a suit laid out like this? Or does the deadman itself take up more space that the suit would do in the wardrobe? Simon, sorry but I don’t know the make because one was a gift from an ex who’s parent’s owned a 5-star hotel, so she gave it to me complete with polished brass and dark teak or mahogany. But I find the second one more practical- a cheapo 40 euro plain vanilla wood bought in hardware supply store. The hotel model takes up a lot of space, while the other is simply the width of the jacket. If you air out your suits for a day or two before putting them back into the closet, your deadman gives you a sort of workbench to lay the trousers, jacket, tie, shirt and shoes. Brushing becomes easier and more automatic for you. Rotating suits outside of the closet with a deadman looks better than having three or four suits with hangers on door handles, bedposts, closet doors. Your place starts to look like some Neapolitan urban nightmare without Sofia Loren. The deadman just rationalizes lack of space more elegantly, while allowing you to brush them after every wear and air out a bit before going back into the closet. Definitely worth it, in my opinion, but i find the cheap model far more practical. I’ve always called it a “valet.” Also have two and they are invaluable. There is a version made by an English firm called Corby that has an integrated trouser press. A long overdue treat I plan to order. Dry cleaning is horrid to clothing (and my cleaners, despite being forewarned, managed to take all the belly out of a blazer’s revers. A word of caution about steaming. Stay away from seams as you can shrink the thread and, in so doing, cause puckers. That’s the word for it. Thanks EAEL. It’s been on the tip of my tongue for days. Good tip on the steaming. Valet! thanks… Couldn’t remember it for the life of me. Great advice. G B Kent & Sons makes beautiful clothes brushes for reasonable money. A little embarrassing but any recommendations as to how to obviate any lingering odour that a suit might retain from wear, without having to resort to dry cleaning? Airing, or are there any products that you might recommend? I know The Laundress do some kind of a spray for example which I have ordered but not tried yet.